One day, inside a police station in a small town, the police inspector was going through some of his case files. The clock on the wall rang eleven times showing 11'o clock. 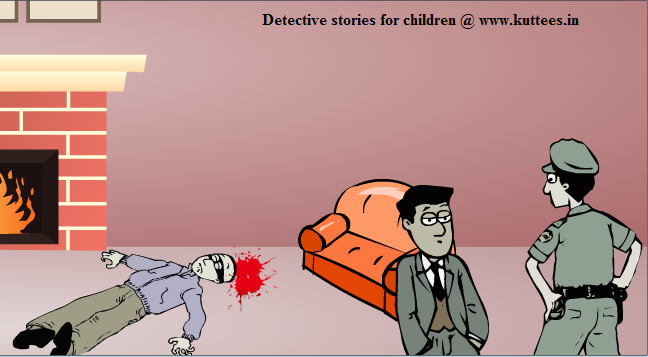 As the police inspector saw the time and again started to continue his work, his telephone started ringing. The inspector picked up the phone and said, "hello". The person on the other side of that call informed about the murder of the rich man in that town. The police inspector was shocked to hear that. He immediately asked his constables to follow and went to that rich man's house. When they reached the house, they saw the rich man's dead body on the floor. There was another man, who introduced himself as the rich man's manager. He said that when he came to see the rich man in the morning, he found him dead, and then he immediately called the police station. The police inspector looked at the room to see if he could find any clue about the murder. He walked near the rich man's dead body and something flashed in his mind. He saw the time in the dead man's wrist watch. It wasn't working but was showing 11'o clock still. The police inspector realized that the clock had stopped working because it had hit the floor with some force as the rich man fell dead. The inspector knew the manager was the one who called him from the same house at 11'o clock in the morning. He immediately caught the manager and gave a big punch on his face to tell the truth. The manager accepted that he was the one who had murdered the rich man. He was arrested and put in the jail. Everyone appreciated the police inspector for his intelligence. I think this is a great article. You make this data fascinating and locks in. You give perusers a great deal to consider and I welcome that sort of composing. Behalf of Sleuths India I wold lke to share my vies on detective in metro city like Delhi Sleuths India is a multi-award winner Private detective in Delhi that is active in this field from more than 17 years. I am sharing my views on detective :Sleuths India is a multi-award winner Detective agency in Delhi that is active in this field from more than 17 years.